This image shows the location of a remarkable source that dramatically flares in X-rays unlike any ever seen. Along with another similar source found in a different galaxy, these objects may represent an entirely new phenomenon. Image Credit: NASA/CXC/UA/J. Irwin et. al. 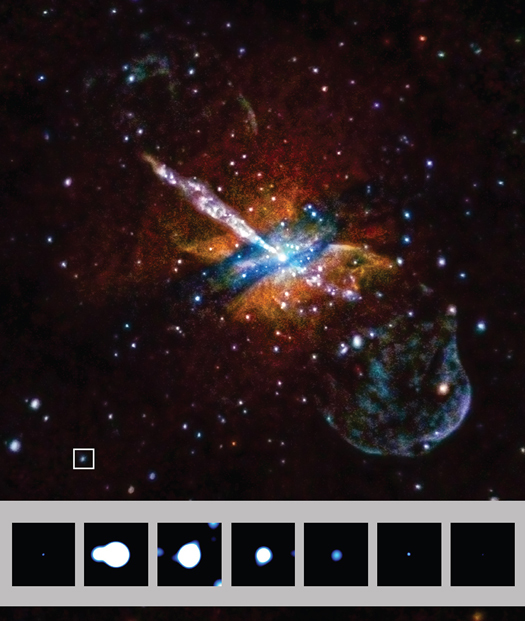 October 19, 2016 – Astronomers have found a pair of extraordinary cosmic objects that dramatically burst in X-rays. This discovery, obtained with NASA’s Chandra X-ray Observatory and ESA’s XMM-Newton observatory, may represent a new class of explosive events found in space. “Now that we’ve discovered these flaring objects, observational astronomers and theorists alike are going to be working hard to figure out what’s happening,” said co-author Gregory Sivakoff of the University of Alberta.